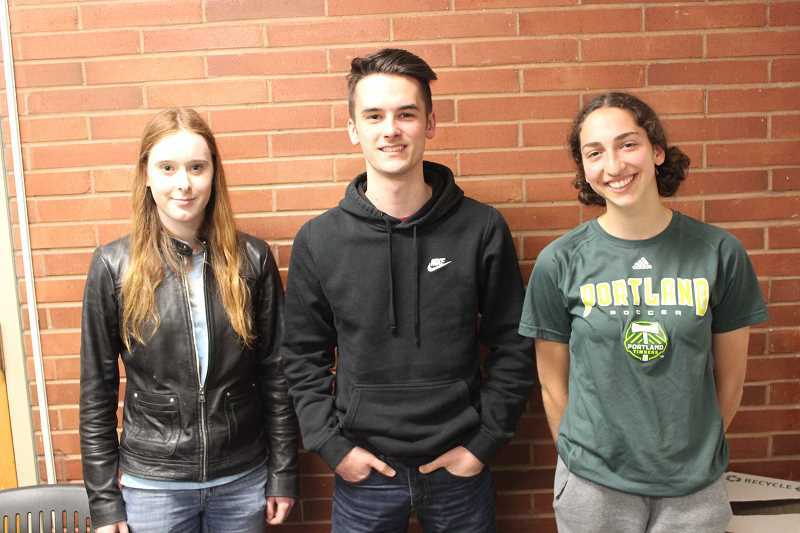 Wilson High students Chloe Unflat, Eden Bell-Wilkins and Sage Finnell recently got to see their own work sitting in the same building as some of the best art Portland has to offer — the Portland Art Museum. Finnell's surrealistic photo, Unflat's drawing and Bell-Wilkins ceramics piece all made the cut for Heart of Portland, Portland Public Schools' K-12 art showcase. "It was cool to see what kind of art is coming out of PPS," Finnell said. "And it was really good quality art from everyone." Finnell enjoyed seeing his art work placed in the museum at the exhibit's opening reception April 12. "I didn't know that it was happening until my teacher pulled me aside and told me 'There's this exhibit going on and I was wondering if I could put this picture up,'" Finnell said. "That was pretty cool to hear because going to the art museum I'm thinking: 'I hope my stuff is up here someday." While most families were gorging out on stuffing and mashed potatoes, Finnell and his family rescheduled their Thanksgiving dinner plans and traveled to the Columbia Gorge on turkey day. Finnell snapped dozens of photos of the serene sights at Catherine Creek and took one of a field of grass, trees and a path in the distance. But his work wasn't done. After uploading his photos, he used photoshop to alter the image, most notably changing the color of the grass from green to pink — evoking a majestic, mystical look. The picture represents Finnell's stylistic taste. He likes twisting reality into surrealism. "You can draw imaginative things or paint imaginative things," he said, "but photography you can't really make something imaginative without editing it afterward." Though she draws rather than photographs, Unflat's aesthetic is similar to Finnell's. Unflat has created art since kindergarten and enjoys eliciting emotions in others with her work. That's what she set out to do when drawing a dollhouse. "I like to take things that are realistic and add color or dimension to them that you wouldn't normally see, so making something normal a little out of the ordinary," she said. During Unflat's advanced art class, the teacher told her class to draw an interior design. Unflat and her mom and sister have a dollhouse at home — which they add and subtract items from every once in awhile. So for the project, and as a Christmas gift to her mom, she decided to draw the dollhouse. The intricately detailed piece includes two stories, six rooms and items such as chandeliers, lamps, a ladder, chairs and a faucet. Unflat used a micro pen and a white gel pen to make the drawing monochromatic. Unflat has visited the Portland Art Museum many times and was excited to see her art displayed in the same building as famous works of art. "It will be cool to see my art not next to the artwork but right by it and be like, 'Wow I've come this far since I was (last) looking at it,'" she said. When Bell-Wilkins set out to create a dinosaur in her ceramics class, she initially wanted to make a tyrannosaurus rex. But after the task proved difficult, she decided to pivot to a triceratops. Nevertheless, her work was good enough to garner a spot in the showcase. And she says unpredictability is one reason why she enjoys ceramics. "It's really challenging because you don't know what's going to happen because your stuff could break or the glaze could turn out weird. It's unpredictable, which I like a lot," she said. The triceratops is one of the best and biggest pieces Bell-Wilkins has ever done. At the Portland Art Museum, it resided in a big glass box. "It was cool to see my art up there," Bell-Wilkins said.